The Prince Albert offers classic pub food and a good range of drinks in a friendly and lively atmosphere. There's plenty to keep you entertained with regular live music. Do you work at The Prince Albert? What did you think of The Prince Albert? Beer wasn't fantastic went I went here last but the place is alright. Nice pub, but the volume... I often go to gigs and I love music but whenever a band is playing in the room upstairs the volume level of the music just spoils the evening for me. It is just too loud for such a small room. I have seen that a large part of the audience tends to move towards the back of the room during a gig to avoid being too close to the deafening speakers. In a small room like this, the back of the room unfortunately is still quite close. It's a shame but I decided not to go to gigs at the Albert anymore because of the very loud volume, no matter who is playing. 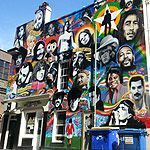 favourite pub in brighton, plays great music, and friendly mixed crowd. Was very impressed with the standard of the bands for such a small venue. Only £4 to get in and beers were cheepish too! Mere moments away from Brighton railway station, at the edge of the North Laines, The Prince Albert is one of the most on the pulse pubs in Brighton. This converted three-story townhouse used to be owned by the same people as Brighton music venue Concorde 2 and is very much a music pub. If you didn't already know that the guys at the Prince Albert are passionate about their music, the graffiti portrait of John Peel on the wall outside should have given the game away. It's traditional-looking and gets pretty busy on a Saturday night with crowds of music-loving punters filling its different rooms. And there are DJs over the weekend playing everything from indie and soul to ska and punk. During the day it's more mellow and you can relax with a pint in one of its alcoves. The upstairs room hosts live music and DJ nights which are some of the hottest tickets in town. The Prince Albert is a little ragged around the edges, but in a genteel fashion and its look is perfectly pitched at the crowd it attracts. Music lovers one and all, when the punters aren't talking music industry talk they're checking out the hottest new bands on the scene in the upstairs room at the Prince Albert before drinking up and moving on to another live music haunt at the end of the night. For such a popular pub the drinks are incredibly reasonably priced. There's Fosters, Hepworths and Tetleys on draught. Happy hour runs Monday to Thursday from 5pm till 8pm and sees students and music industry bods rubbing elbows at the bar. During summer the jugs of Pimms for £8.50 are the drink of choice whilst in winter shots of Tuaca, Jagermeister and Sambuca for £2 each help the party go with a swing. The Prince Albert may have the same name as the nickname for an intimate body piercing but don't let that put you off. This is a music lovers pub that pulsates with soul. One of the finest pubs in Brighton.